Six North Korean teenagers stood public trial in Ryanggang Province in northern North Korea on March 22 for listening to South Korean pop songs and dancing to them, the Asahi Shimbun reported on Monday. Shortly afterward, their leader Kim Jong-un was doing the same at an official concert in Pyongyang. Four of them were sentenced to a year's hard labor for "plotting against the state." The sentence of the other two was not clear. All were sent to a prison camp after the trial. Once sentenced to hard labor, offenders are forced to work for six months to a year. Ryanggang Province is a border area close to the Apnok River. The six teenagers reportedly listened and danced to about 50 South Korean pop songs which they copied on a USB memory stick and handed to other people. Just 10 days after the trial, about 160 South Korean musicians including girl band Red Velvet gave concerts in Pyongyang on April 1 and 3. North Korean leader Kim Jong-un and his wife attended the first one. 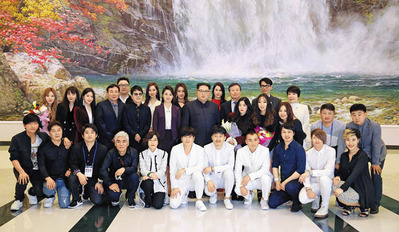 North Korean state media reported on Kim's attendance but mentioned neither the names of the South Korean musicians nor the titles of their songs and muted the sound.